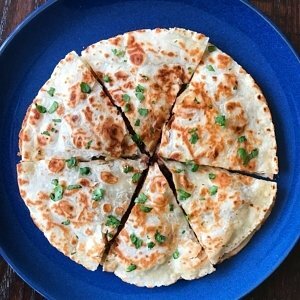 This was seriously one of the best quesadillas and a perfect, easy weekday meal. Sautéed mushrooms & Swiss chard, seasoned with garlic, coriander, and red pepper flakes, brightened with a touch of apple cider vinegar and cilantro, then mixed with Monterey Jack cheese. Seriously, I could have eaten a bowl of the filling itself! It was rich yet light, slightly tangy, fresh and just the right amount of cheese. It also happens that Swiss chard is one of my favorite leafy greens and easily enjoyed by the family because it doesn’t have a strong flavor or texture. I was kind of hoping that my son wouldn’t like this so much so there would be more for me! haha But he loved it as did the rest of us! Recipe adapted from America’s Test Kitchen, I reduced the amount of cheese and oil, and prepared the tortillas separately and filled them as you would a sandwich. This way there was no worrying about flipping them and the filling falling out. 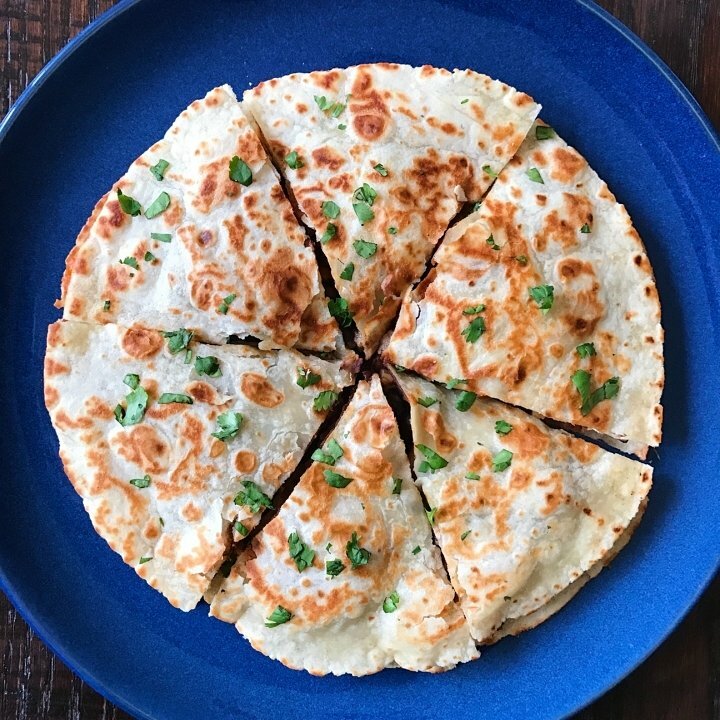 In addition to being delicious and nutritious, I love that the filling mixture could be prepared ahead of time and heated up when ready to make the quesadillas. Heat 2 Tbsp oil in a skillet over medium-high heat. Add the mushrooms and onions, season with salt and pepper. Cover and cook, stirring occasionally, for about 10 minutes or until mushrooms release their moisture. Uncover and cook, stirring occasionally, another 10 minutes or until the liquid evaporates and mushrooms are well browned. Stir in the garlic, coriander and red pepper and cook about 30 seconds - 1 minute. Add in Swiss Chard, cover and cook just 1-2 minutes until wilted but still bright green. Then uncover and continue to cook, stirring occasionally as liquid evaporates and the mixture continues to reduce, about another 4-6 minutes. Remove the pan from the heat, add the cider vinegar and stir to incorporate. After a few minutes cooling, mix in the cheese and cilantro. Heat a frying pan over medium heat, spray with canola oil spray, place one tortilla in the pan and gently heat it about 1-2 minutes. You will notice it appears to bubble up a bit as it cooks and browns on one side, flip and repeat with the second side until the tortilla is cooked to your liking. Prepare all your tortillas this way and set aside. Prepare your quesadillas as you would a sandwich. Add generous spoonfuls of the vegetable mixture atop one prepared tortilla. Top with another. Sprinkle with cilantro and enjoy as is or with a touch of sour cream.